One of the finest mid 19th century comparative mountains charts. Tableau comparatif de la forme et de la hauteur des principales montagnes du globe terrestre, dedie a Monsieur le Baron, Alexdre. de Humboldt. An exceptionally attractive and unusual 1850 comparative mountains chart by Andriveau-Goujon. A fine mid-century example of the comparative chart convention. Shows many of the world's greatest mountains and volcanoes in proximity to one other such that we can compare and contrast not only their heights, but also their forms. 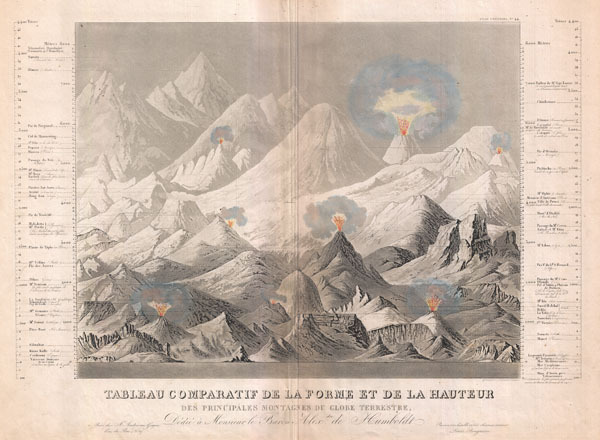 Illustrates eight volcanoes shooting flames into the air. Dhaulagiri, in the Nepali Himalayas is identified as the world's greatest peak. The names and elevations of the various other peaks shown are identified textually to either side of the chart proper. In the lower quadrants of the chart some subterranean distances are shown, most specifically the Mines of Anxin. Title area at the base of the map includes Andriveau-Goujon's dedication of this chart to Alexander von Humboldt, who's early 19th century work inspired the entire comparative geological chart genre. Drawn c. 1850 by Ambroise Tardieu for inclusion as plate 44 in Andriveau-Goujon's Atlas Universal. Andriveau, J. and Goujon, J., Atlas classique et universel de geographie ancienne et moderne, contenant les decouvertes et les divisions les plus nouvelles dans les cinq parties du monde pour servir a la lecture des voyages, des ouvrages historiques et des meilleurs traites de geographie, 1850. Very good. Minor verso reinforcement and toning along original centerfold. Else clean. Rumsey 2486.043. Phillips (Atlases) 791-44.